Even as we wait for the final results from Missouri to come in, it is already clear that the 2008 election has exceeded all democratic hopes from the primary season. 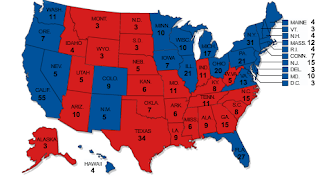 With Barack Obama's nomination, new swing state opportunities were expected to open up (Colorado, Virginia), but traditional swing states like Florida and Ohio had seemed to move into the "leaning red" column again. Obama's sweeping success in all swing states has thus created the label "landslide" for this election, and the electoral college may suggest so. But is this election truly a mandate for the Obama administration? Has the country united and spoken with one voice, rejecting the Republican party of the past years? A historic perspective and a closer look at these results may help us to answer this question. The electoral college system with "winner takes all" in nearly all states inherently tends to overstate the winner of a race. It is in fact statistically feasible to have an electoral sweep with only 51 more votes than one's opponent. The more balanced the political attitudes across states are, the more likely it is for a relatively small popular vote advantage to turn into an electoral landslide. Barack Obama has worked the electoral college exceptionally well, translating a 6.2% popular advantage into a 38% advantage in the electoral college. Missouri aside, Obama has won all close states, three of them by an average margin of 1.3%, translating into 53 electoral votes. It has been great to see that Obama could pull through in these tight races, but we need to remember that these states may be called blue now and will be in play for democrats in the future, but that they have a very large red minority that will almost certainly be reenergized with the Bush years in more distant memory. The popular vote spread is 7.8 million, or 2.6% of the total US population, 3.4% of the voting-age population. While we cannot assume that those who have not voted on Tuesday had a genuine interest in the political future of the country, it is important to remember how small the 7.8 million difference really is compared to the US population. Under the given circumstances and with the nationwide disapproval of the Bush administration, this result is still surprisingly low. After two long election nights (one of them taking many weeks until we knew the result), we had certainty before the last polls closed this year. But a look at the elections before 2000 (and thus before my personal political memory) will give us a better perspective on the true meaning of Tuesdays electoral college results. Reagan, Bush 41 and Clinton had all won each of their elections with at least 370 electors in their favor, and of the 21 elections since 1920, 17 (81%) have been by at least that margin. Roosevelt's 523 and Reagan's 525 are among the outliers for nationwide landslides, and the popular vote has swung the same way. It seems surprising after our euphoria on Tuesday, but Obama's win had been the 7th closest in the electoral college of the last 24 elections. With all this said, I will not fall into agreement with Robert Novak's column, who tries to make this election look like a close one. It hardly seems possible any more to get the lopsided wins that FDR or Reagan won in their times, with the nation's political opinion's so regionally polarized. A democratic Kansas seems as unlikely as a Republican Vermont. The number of independent voters who make up their mind anew for every election is small, and the swing for Obama is thus very significant. But we need to remember that with all the current Democratic dominance, we are by no means safe from losing it all over the next four years. It will thus remain crucial to work across party lines, not only to avoid a filibuster. The disapproval of the Bush administration still has not solidly turned into Democratic support. Despite continuous polls predicting the outcome of this election in almost every swing state accurately, Democrats have been worried until election day and were genuinely surprised about the lop-sided electoral college outcome of this election. The reason for this phenomenon is not plain liberal pessimism, but the rational result of the experience of the past elections. The reason for the caution lay in the faulty polls of the last two election cycles and the freakish ability of Republicans to pull out last minute victories in a hostile environment (2004). Democrats have ever since lost faith in their ability to actually follow through and pull off a victory. In 2008, neither of the phenomena has occurred in the least. The polls have been amazingly accurate with Politico's Swing State Map coming very close to a perfect prediction (even Missouri, Indiana and North Carolina only swung back to Republican in the last few days before the election, which can possibly be discounted by the early voting already completed before). After the pollsters were chastised in the last two presidential elections, they have clearly done their homework and predicted the outcome of this one almost flawlessly. Secondly, the McCain campaign was nowhere near the quality of Bush/Cheney's team in the last two elections. The poor vetting of Sarah Palin or even Joe the Plumber (they heard about him on Drudge and invited the unlicensed plumber to be the central theme of the campaign promptly) and the endless swings for responses to the economic crisis have proved the Democratic fear of Republican voter psychology genius wrong. It is a misconception that this election was not winnable for a Republican candidate in this environment. McCain's brief upswing after the convention proved that voters were not set on a Democrat this fall. But is may well be true that the election was not winnable for McCain, who was prepared to win this election on foreign policy expertise and was thrown back by the tumbling economy. A more dynamic candidate with economic expertise and a disciplined campaign could have worked wonders even now. The poor handling of the campaign provided the final dagger for McCain/Palin '08. The question remains whether Democrats will be able to move past the traumatic experience of losing in 2004 and 2008 and the feeling of getting robbed by Republicans twice. Paranoia has swept the party and a win was absolutely necessary to stop the nagging fear that Democrats no longer have what it takes to close the deal. This win should restore confidence and eliminate the fear that Republicans can magically pull off an undeserved victory. They had the same tool box available in the last three election and utilized it very well in 2000 and 2004. In 2008 they needed to work it to perfection and fell well short, while Democrats used the same tool box with nearly no flaws. We have taken the first step to get over this paranoia and now need to look ahead with optimism, knowing we can win. The higher the score for a given category, the more liberal (in the American politics sense) the person is for that topic. The smaller the number, the more conservative. One could also say that the more total area in a Lefty's Square, the more liberal a person is overall. For our purposes, let's say conservative spans from 0-3, moderate from 4-6, and liberal from 7-10. The following example is a person who is liberal on economics (8), left-moderate on social (6), conservative on Civil Liberties (3), and right-moderate on Foreign Policy (4). You can try to imagine who this might be. The federal government should impose a highly progressive tax structure. For this question, if the respondent said 5, they would be given +5 to their Economic score. At the end of the survey, each categorical score is divided by the denominator (total possible) and multiplied by 10 to get the numerical score for that category. Many questions will involve more than one category. For example, issues like abortion or warantless wiretapping are a combination of factors. Let's say abortion is 1/2 civil liberty and 1/2 social. If you score a 3 on a question, it is multiplied by the weight for each category. 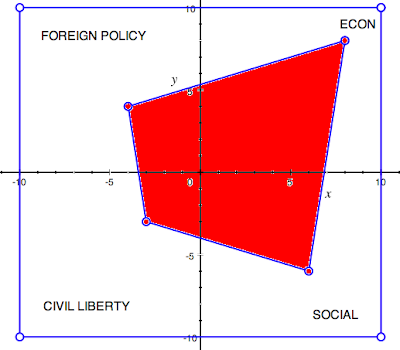 In the end, we are given a nice shape that gives a more detailed description of one's political views. Hopefully, we will launch a survey for Lefty's Squares in later weeks for you to try it out yourself. In future posts, I will evaluate certain politicians (or Lefty's authors) and show you how we generated their Lefty's Square. If there are any requests for certain people, feel free to post your suggestions. "We've gone from the back of the bus in the 1960s to the WHITE house in 2009"
There is obviously still a lot of work that needs to be done to erase racism, classicism, sexism, heterosexism, etc. but I think last night was a HUGE step in the right direction for not only America, but also for the world. Speaking to a few of my South African friends online last night made me realize that Obama's win is being celebrated all over the world. Hopefully this will mean significant, positive changes for minorities, women, gays and the middle and lower-classes. Call me overly optimistic, but I think it will. "NOTHING can stand in the way of the power of millions of voices calling for CHANGE" -Barack Obama '08, so let's not forget, the fight to end injustice doesn't end here--now the real work begins. Looking at the most recent state polls, I predict Obama will win every Kerry state plus Nevada, Colorado, New Mexico, Iowa, Ohio, Florida, and Virginia. The polls for North Carolina, Indiana, and Missouri have all been very close, so I will be cautious and give them to McCain. If they flip I'll be pleasantly surprised.